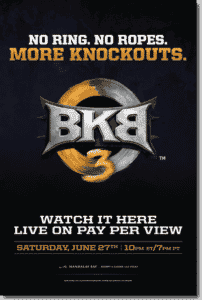 On June 27th, BKB returns for the third time LIVE from the Mandalay Bay Events Center in Las Vegas. When it does, DIRECTV for BUSINESS™ customers will receive exclusive access starting at just $99! This installment of BKB will feature all the hard-hitting action fans love, with more knockouts. Your bar and restaurant customers are going to be knocked out by all the action and excitement BKB 3 will bring to your establishment. Be sure to subscribe to this exclusive event you can only see on DIRECTV! CLICK HERE to download a fact sheet with pricing and BKB details. Customers who purchase BKB 3 will receive a marketing kit 3-5 business days after the order is placed. Additional BKB 3 merchandise can be ordered on DIRECTMVP.com. For more information, visit www.bkb.tv. Dont Have DIRECTV in Your Bar or Restaurant Yet?